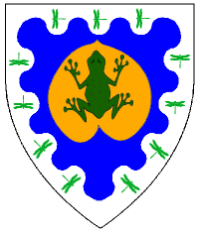 Azure, on a heart inverted Or a frog vert, on a bordure wavy argent an orle of dragonflies in orle vert. Name registered with the College of Arms in July 2015. Device registered with the College of Arms in August 2015.